We hardly ever fry anything, but when we do, it’s usually chicken. 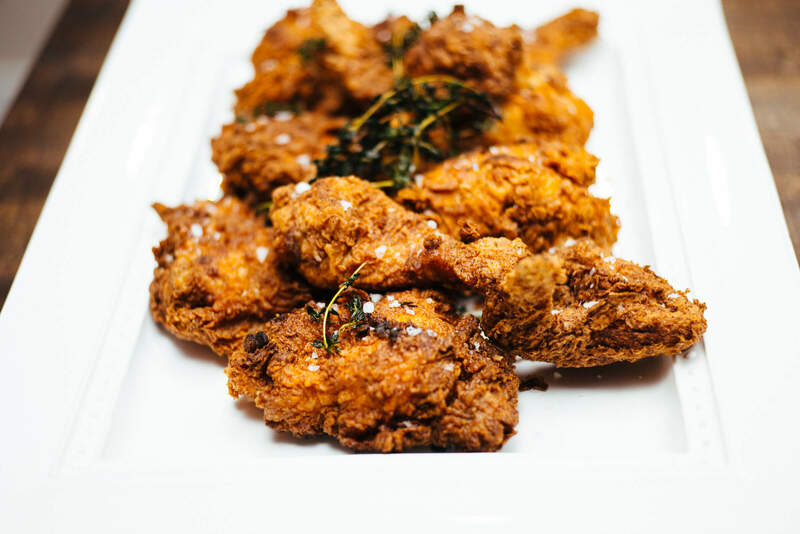 We’ve worked for several years to perfect our favorite Spicy Buttermilk Fried Chicken recipe, and it’s finally ready to share! We think the best time to make fried chicken is when you’re having lots of friends over. Having a lot of people to share it with makes it worth the trouble to make (and unfortunately, clean up). When we have friends over for fried chicken, we make a lot (great for leftovers) and serve it with classic sides like smoked gouda mashed potatoes or meyer lemon potato salad, mac and cheese, and cornbread. We start with whole chickens cut into 10-pieces. We ask our butcher to cut it up and split the breasts in half, which helps make sure everyone gets perfectly cooked white meat! We start brining the chicken in the morning. Clayton has developed his own brine with 7% salt, which is on the stronger side, and makes for quicker brining. If you have a tall stock pot, you can make the brine in the pot and then add the chicken once the brine is cooled. We typically brine the chicken in these food prep containers. The larger ones are great for brining turkey at Thanksgiving. You can make your breading earlier in the day to get some of the prep work out of the way as well. Our breading uses all-purpose flour, garlic powder, onion powder, hot cayenne pepper (it comes in multiple strengths, use this one), and smoked paprika. We also add two tablespoons of our favorite hot sauce to two cups of buttermilk. 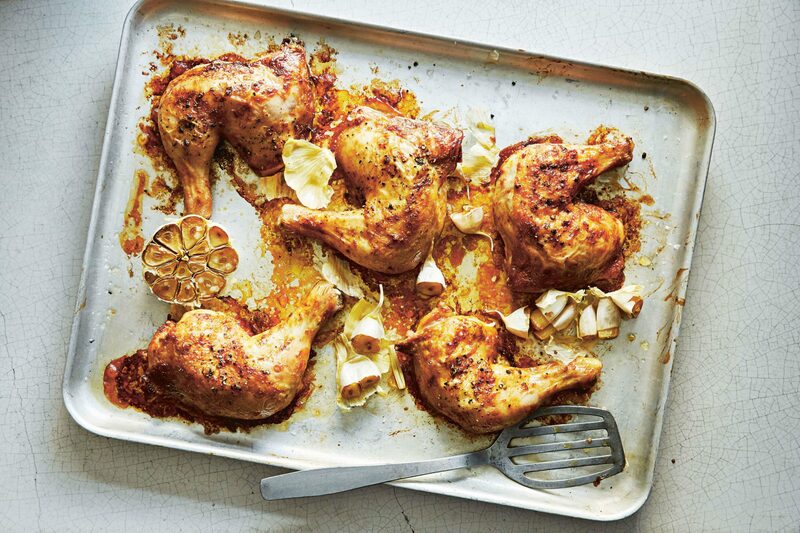 After your chicken has brined most of the day and you’re ready to fry it, take it out of the brine and pat it dry with paper towels on a baking sheet. You have several options for a frying pan. We typically use a cast iron dutch oven (this one) since it retains heat better than steel and keeps the temperature more consistent as you add and remove chicken pieces. We’ve also had good luck with this pan, and if you have a cast-iron fry pan with high enough sides, that would also work. To fry the chicken, set out three containers in a row, and put 1/3 of your breading mix in the first container, the buttermilk and hot sauce in the second, and the remaining 2/3 of breading mix in the third container. We use hotel pans (perfect set of 3 here). Heat 3″ of peanut oil in your frying pan. Only use peanut oil! While the oil is heating, add a handful of thyme sprigs to the oil. This infuses the oil with thyme, and smells great. Additionally, once the thyme is sizzling and crispy, you know your oil is hot enough to fry. Remove the thyme and set aside to use as a garnish later. Use a thermometer so you can maintain the temperature at 350° F.
Dredge chicken pieces in the first container of flour mixture, then dip in buttermilk, then in the second container of flour mixture, and immediately add to the pan. We like to have a wet hand and a dry hand, keeping one hand dry (for the first dredging) and then use your other hand to dip in the buttermilk and second breading. Cook the chicken in 4-5 piece batches, just be sure not to overcrowd the pan. Let the chicken cook for 3-4 minutes, then flip it and cook 3-4 more minutes on the other side. It takes about 7-10 minutes to cook the chicken through. Remove the chicken from the oil when it’s golden brown on all sides and put it on a sheet pan in a warm oven while you cook the rest. 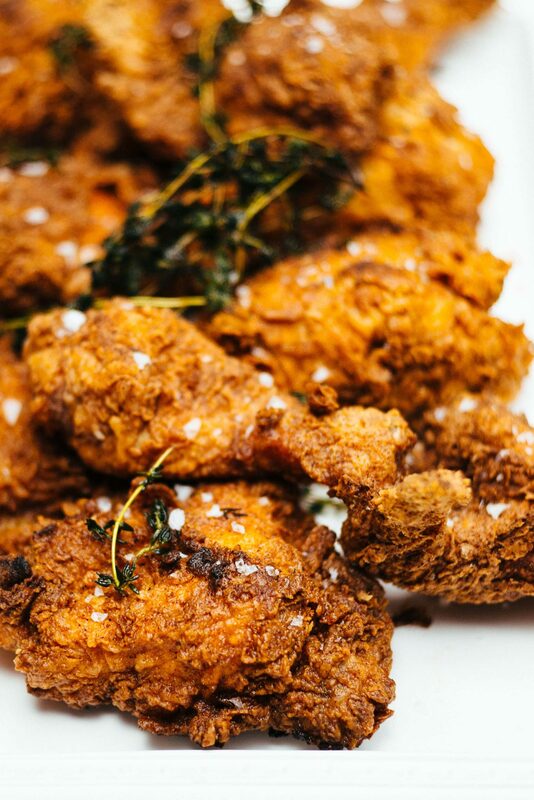 To serve, arrange your perfectly fried chicken on a large platter (ours discontinued from Crate & Barrel, but you can find similar here, here, and here) and garnish with thyme sprigs and a sprinkling of Maldon sea salt. 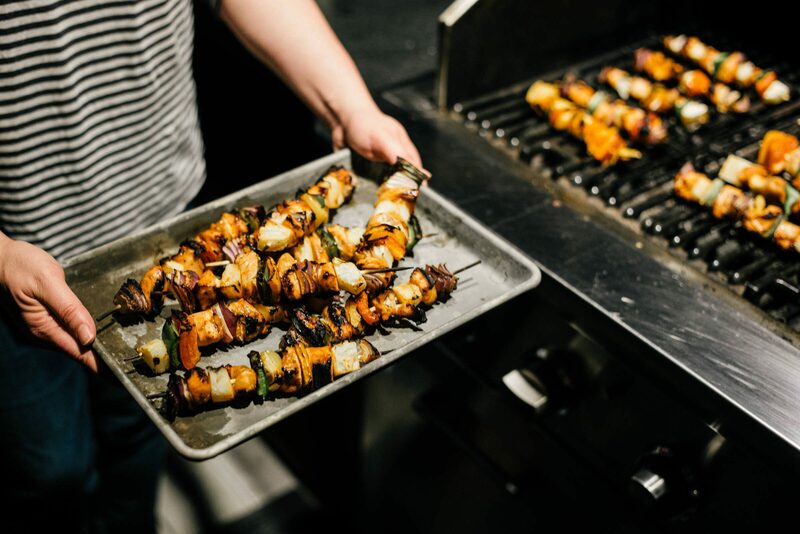 Check out more of our summer recipes and cocktails here. For the brine, put one liter water in a stock pot and add ½ cup of salt. Heat over medium heat until the salt is dissolved, then remove from heat and add the lemon, bay leaves, garlic, 3-5 sprigs of thyme, and peppercorns. Ice the remaining liter of water and add to the warm brine to chill. Put the chicken in the brine and refrigerate until ready to fry. For the breading, combine flour, onion powder, garlic powder, hot cayenne pepper, smoked paprika, 1½ tablespoon salt in a large mixing bowl. Reserve until ready to fry chicken. To fry the chicken, heat peanut oil (3") in a dutch oven or deep cast iron skillet to 350° F. Add a handful of thyme sprigs to the oil as it warms. When the thyme sprigs are crispy, remove and reserve to use as a garnish. Divide breading mixture between two hotel pans and put the buttermilk and hot sauce in a third hotel pan. 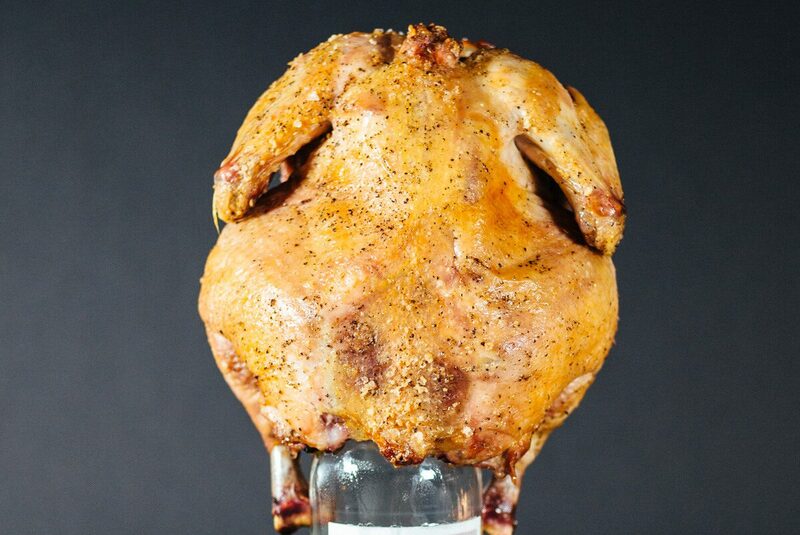 Remove chicken from the brine and pat dry with paper towels. Fry the chicken in batches of 4-5 pieces, dredging each piece in flour mixture, then buttermilk, then again in the second pan of flour mixture, before adding to the hot oil. Cook 3-4 minutes per side, then remove from the hot oil and keep warm on a sheet pan lined with paper towels in a warm oven. To serve, arrange chicken pieces on a serving platter and garnish with thyme and Maldon sea salt.